This EQ Research study examines the use of electric utility class cost of the service studies (CCOSS) in utility rate cases and rate design and explains why a CCOSS is an incomplete tool to make decisions about how customers pay for electric service. 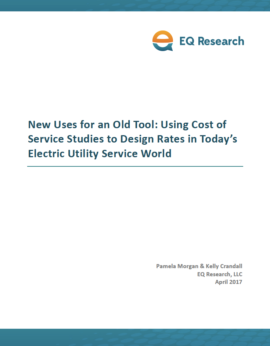 The report, New Uses for an Old Tool: Using Cost of Service Studies to Design Rates in Today’s Electric Utility Service World, also explores the history of the CCOSS tool in ratemaking and how the industry can best use the tool in reaching better outcomes. After a lull in the 1990s and 2000s, the number of general rate cases has been surging in recent years. Aging infrastructure, the digital economy, and new technologies and customer needs are driving investments in distribution systems and software, all while many utilities experience stagnating electricity demand. In today’s rate proceedings, utilities, regulators, and industry stakeholders are coalescing around the use of the CCOSS as a direct tool for rate design; but traditionally, CCOSSs were considered informational – useful as a framework for discussing class revenue requirements and rate relationships, but not for determining the actual prices charged for electric service. The modern CCOSS is poorly suited for answer the challenging rate design questions the industry faces today. Use the form to the left to download the report, and click here to read a blog about the report.